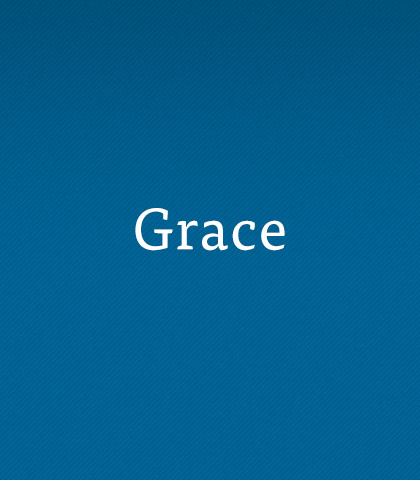 The word grace is a short, simple word. But understanding the biblical depth and meaning of grace can take a lifetime of study and application. It's almost a shame that a word describing suppleness of movement or a short, quick prayer before a meal is the same word we use to describe God's unfathomable love for sinners. Nevertheless, it is grace that moves Him to offer us the free gift of salvation and forgiveness. Grace is what compelled the Apostle Paul to write of a mystery never understood before (1 Corinthians 2:7-13). Grace is also what allows us to relax into another's accepting embrace as he or she gives us the freedom to discover our unique journey laid out by God. So relax as we journey together down the path toward freedom and the wonderment of the surpassing riches of God's grace! Pride can lead to an independent attitude, leaving little room for acknowledging one's needs or accepting another's attempts to give. Grace that is really amazing is grace that is truly accepting. Horizontal grace is our giving to God and to others. We don’t do it to reciprocate but simply because where there is grace there must be giving. Grace is the oil that decreases domestic friction and prompts us to release our partners to be all God would have them be, all the while affirming one another in an atmosphere of unconditional love. Grace is a great need among all of us who minister in any capacity as members of the Body of Christ seeking to fulfil our callings as followers of Jesus Christ. Some people believe in Christ as Saviour and yet their lives remain graceless. Ask yourself, "Am I one of them?" Keep your answer in mind as we discover the impact grace can make in a person's life. Having a grace state of mind doesn’t mean life automatically becomes a super-harmonious downhill slide. We will still have to live with disagreements. As people of grace, our goal is not to force everyone to agree but to press on in spite of disagreements. In this lesson, let's turn our attention to that horizontal dimension and learn to help others find the same freedom God grants us, as we accept them as they are and release them to learn and grow. There’s no other way to God than through Jesus Christ. By embracing a life of grace we can treat people not as they deserve but as God treats them. All of us who are tempted to abuse the marvellous grace of God would be wise to examine and apply the guidelines set forth in this powerful paragraph from God's inerrant Word. More often than not we don’t know what causes people to act how they do. That’s why it’s always appropriate to extend grace. Always.